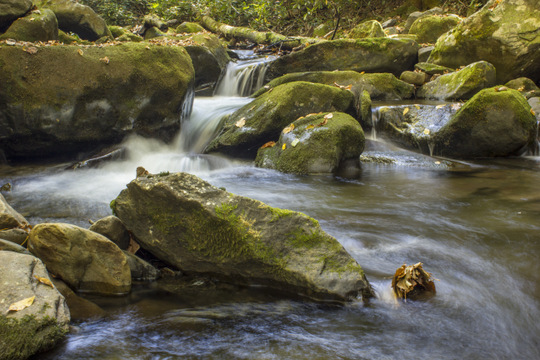 A while back I complained about a lack of stream etiquette on a local stream in the Smokies. Since I complained about poor etiquette, it is only fair that I commend exceptional stream etiquette. A week and a half ago, I experienced two examples of perfect stream etiquette in one day. The first came after I had been fishing hard for a couple of hours and was getting hungry. I had camped the previous night at Elkmont and had got up at first light to take down camp and hit the stream. Finally my hunger caught up with me so I headed to Metcalf Bottoms Picnic Area to enjoy some delicious chili and chips. A hot meal is always a treat so I fired up the camp stove and was working on breakfast. When I had pulled in, I noticed what appeared to be 2-3 anglers gearing up further down in the picnic area. After heating up my food and starting to eat, I noticed one of the anglers walking my direction. It turned out to be guide Charity Rutter of R & R Fly Fishing (which she owns along with her husband Ian). I already knew that both were great anglers and guides and of course good people in general. What I didn't expect was the incredible generosity and politeness. She inquired whether I was planning on fishing since she didn't want to get in water I intended to fish and asked if I was planning on fishing there, with or without clients. Mind you, she and her clients were there first so in any reasonable understanding of stream etiquette, they had first dibs, the right of way, whatever you want to label it. That is what I call stream etiquette done right and then some. If you know Charity, then this won't surprise you probably as she is one of the nicest people you will ever meet, but it is always a pleasure seeing and experiencing such politeness out on the stream. Of course I told her to fish the whole section. Not only was she there first, but I was just fishing for fun and she was earning a living. I hadn't intended on fishing there anyway, but even if I was, I would have found a different spot. The second case of good stream etiquette occurred on the same day. After my delicious brunch I hit another spot before heading up to Elkmont to combine my loves of hiking and fishing. There was a section of stream I had been wanting to hit ever since returning from Yellowstone. With a beautiful sunny day, I knew that I wouldn't find a better time this year. After a good hike in, I stopped and was working on rigging up while sitting alongside a popular pool. Mainly the pool is popular due to its proximity to the trail but it does hold some nice fish and offers the chance to fish dry flies. I had yet to decide whether to fish that hole, but to all appearances I was preparing to do so. Just as I was finishing rigging up after a minor mishap of spilling my dry fly box, I noticed two anglers coming down the trail. One was guide Rob Fightmaster (www.fightmasterflyfishing.com) and the other was apparently his client for the day. We chatted for a few minutes and Rob asked about my Yellowstone trip. I of course asked what water they had fished above me so I wasn't fishing used water. Then I asked if they were fishing their way back down the trail. Rob confirmed that they were and mentioned that they had thought about the pool at our feet but would leave it to me. Again, great stream etiquette. Rob could have justified jumping in because he was making a living or even because I was sitting at the head of the pool, but he did not. Naturally, I told them to jump in and fish it. Rob was making a living that day while I was just fishing for fun, not to mention that my real goal was the stretch upstream from there. Probably it is a bad business idea to promote companies and people who are technically my competition, but good deeds should be rewarded. 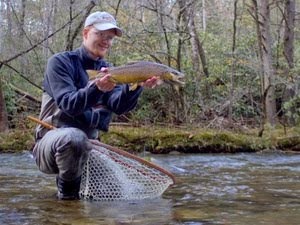 Of course, I hope if you need a guided trip in the Smokies that you will contact me, but I can honestly say that I'm very confident that you would have a great day fishing with any of the guides listed above. Ultimately, these two cases illustrate one of the most important aspects of stream etiquette: when in doubt, ask. Talking to fellow anglers will usually make your day better. 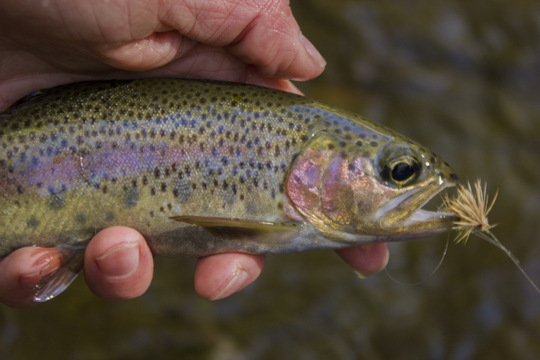 Asking where they plan to fish and then choosing other water will go a long ways towards making new friends on the stream. My reward for giving up that pool? I had one of the best days of dry fly fishing I've had in a long time. 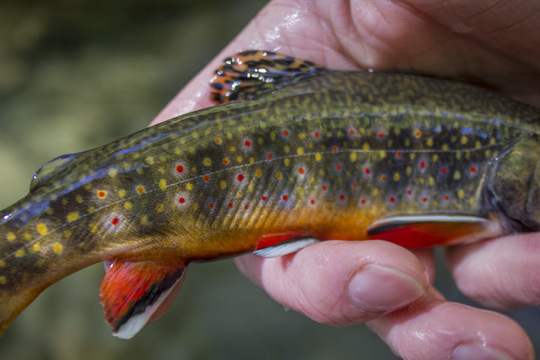 There is nothing better than a native southern Appalachian brook trout in a high country stream. 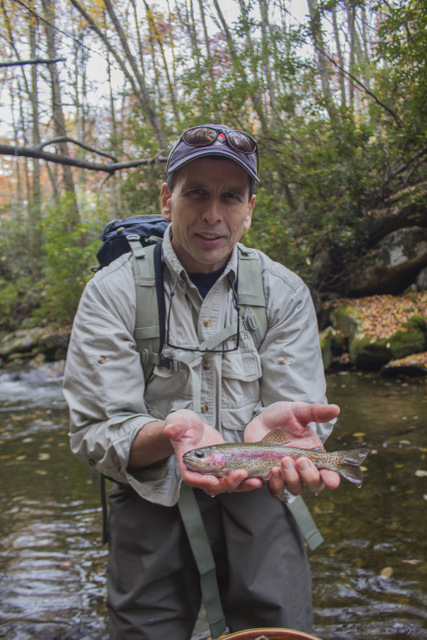 A true jewel of the Smokies, these fish have been here since long before we showed up. Thanks to a lot of hard work by the Park fisheries department, these fish should be here for a long time to come. This is my favorite season, but every year fall seems to be here and gone all at once. This past weekend featured the best fall colors we have had in a while depending on where you were. This week, a cold front passed through bringing some rain and lots of wind. The rain was fine, but I'm sure the wind was a nightmare if you were a leaf stuck on a tree. Lots of those have been spotted crashing falling to the ground. The yard is now in desperate need of a rake and a few hours of my time. 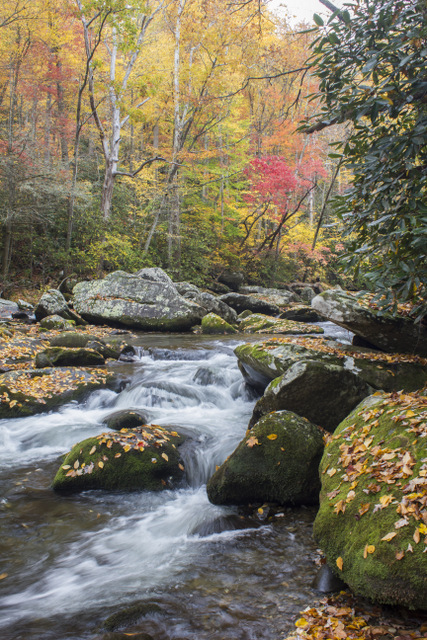 All of this has created some tough conditions in the Smokies if you are a fisher person. Leaves in the water make for some difficult drifts. Thankfully, the worst of the 'leaves in the water' routine should be over in the next day or two and may already be. Not that the leaves have magically vanished, but they should be settling out of the current. That means to be careful of seemingly harmless leaf piles. People have been known to be swallowed up in those things. On the brighter side, the fishing has been very good to excellent. 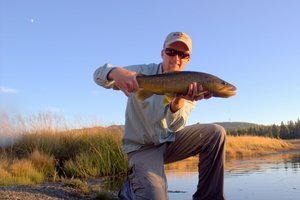 Fish are eating dry flies of all sizes. Stick with large orange ones if you like like big bugs, while small ones of the olive variety should do well if you enjoy matching the smaller bugs of fall. The variety has been better than usual so have plenty of other patterns with you as well. If you enjoy throwing streamers, you can even find some fish that way. In fact, just a couple of days ago I had one of my better streamer days ever in the Park in terms of fish spotted. Lots of those fish missed the hook however. Still it was a great day to be out and get some time in on the water for myself. One of the best things about fall is the opportunity for sight fishing. Creep along the banks slowly and watch for trout. If you can see the fish without spooking it, then you have a great chance at hooking it with a good cast. This past Monday, I had the pleasure of showing Don Armstrong some of my favorite places on Little River. He quickly picked up on the high stick techniques that are so important to success here. An orange Elk Hair Caddis in size #12 with a Mr. Sleepy (my Isonychia soft hackle pattern) underneath proved deadly with about 50% of the fish on top and the rest on the soft hackle. The highlight of the day was when I spotted a nice fish under the current at the head of a large pool. Carefully showing Don where to cast, he maneuvered into position and made a great cast on the very first shot. 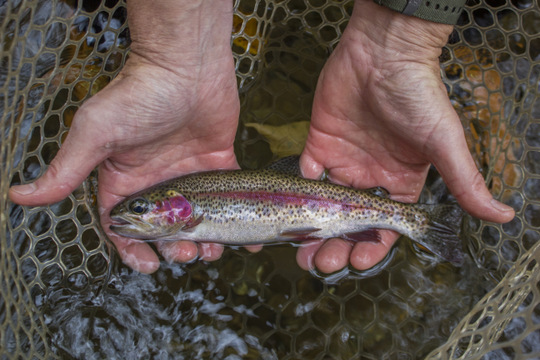 The fish rose to the dry fly and we were soon admiring one of the prettiest wild rainbows you will ever see. Great fish Don! While the end of the fall colors often signals a change to colder weather, this will not be the case this year. Next week, high temperatures are forecast to be well into the 60s and even lower 70s. This should bring the dry fly bite roaring back so plan on getting out to experience a late Indian summer this year. If you are interested in a guided fly fishing trip, please contact me (David Knapp) at TroutZoneAnglers@gmail.com or call/text (931) 261-1884. Thanks! 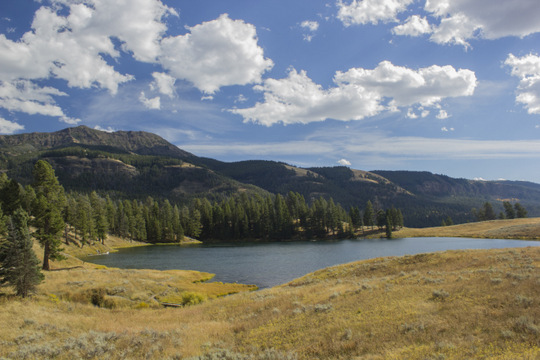 Fly fishing in Yellowstone is all about tough decisions. 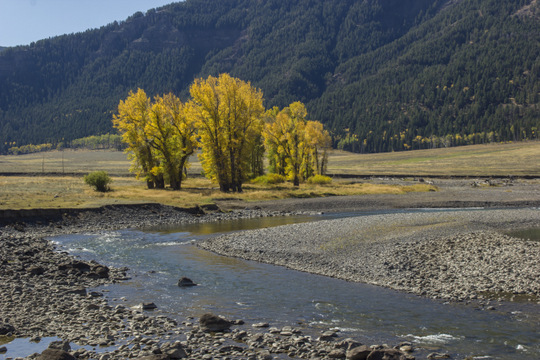 For example, should I fish the Lamar River today or perhaps the Yellowstone? Or the west side rivers such as the Madison, Gibbon, or Firehole? Or numerous other fantastic streams, rivers, creeks, lakes, ponds...well you get the picture. I suppose it is a good problem to have, and like most other decisions in life, the best way forward is to simply decide and be done with it. 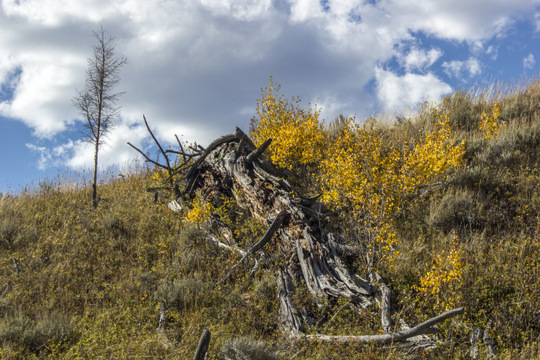 So I found myself headed for the Lamar River Valley in the northeast corner of Yellowstone National Park. My second full day in the Park was bright with promise and more than a hint of the unseasonably warm afternoon in store. After the great breakfast at Canyon the previous day, I almost stopped again a second time, but knew that I had plenty of food that needed eating. With the chilly early morning, this kicked off a routine that stayed largely intact throughout my camping trip: drive to my fishing location early, and then eat breakfast by the water while things warmed up. That proved to be a winning formula that I'm still using here in Tennessee. Upon arrival in the Lamar Valley, I found an open pulloff and fixed a breakfast of bagels, yogurt, granola, and carrot sticks (hey, I needed something fresh!). After eating, the water nearly at my feet was still open so I quickly donned my waders and rigged up a rod appropriate for the conditions. My 9' 5 weight Sage Accel seemed ideal for the mix of nymphs and midges early in the day that would, I hoped, transition to dry flies or even hoppers in the afternoon. Little did I know what was in store for me that day! In the first 70 yards or so of water, I saw a couple of fish that lazily crept up to glance at a heavy tungsten bead head Pheasant Tail nymph, but they just weren't ready to commit to such an offering. Just upstream, a large pool was formed where a riffle dumped into a seemingly bottomless hole. To one side there was a large rock formation sticking out into the current with a large back eddy on the upstream side. And in that back eddy? A big foam mat with noses poking through regularly to take some microscopic bug. Not one to shy away from a challenge, I forded the riffle across rocks that were surprisingly slick. I was wearing my Patagonia boots with rubber soles and found they just weren't as good as felt. Creeping into position just above the back eddy, I started casting my hopper with the heavy beachhead nymph dropper. A couple of half-hearted slashes told me that they knew what hoppers were but probably just weren't expecting to see any this early in the day. A change of flies was in order. 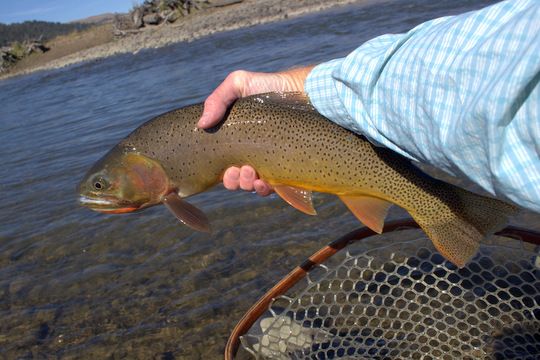 A smaller dry fly was my first attempt, but these fish were more stubborn than your average cutthroat. Next I dropped a Zebra Midge behind the dry fly and that proved to be the answer and good for 3-4 fat trout. Eventually I decided that the majority of fish under that mat were probably either spooked or just getting smart so I headed on upstream. Fording the riffle was again treacherous, but just short of impossible. In other words, I was nervous the whole way, but in the end it worked just fine. Vowing to stay on my side of the stream from here on out, I moved up to the next pool, this one a nice bend pool. All things considered, this pool just didn't seem like the midge factory that the previous spot had been. With a lack of rising trout, I returned to the hopper/dropper setup and significantly increased the dropper length for such deep water. Slowly working into the inside of the bend, I was finally throwing my flies into the riffle at the head so the nymph would sweep over the drop off. Just as I had hoped, the hopper shot down after several drifts and when I set the hook, a big golden slab flashed. As with most situations where you have a big fish on the line, my heart momentarily stood still before panic set in. Just as quickly I realized that only a calm effort on my part would ultimately help me to land the fish. Talking myself through the fight, I fought the fish and countered its every move. Every time it would start to come up in the water column, I caught a glimpse of those bright golden flanks. Finally I slipped the net under and the fish fell in just as the nymph fell out of its mouth. Talk about a close call. The big cutthroat would prove to be one of the largest I landed during my trip, measuring right at 19 inches. After such a long fight, I didn't want to go through the whole hero shot routine so I took a couple of shots in hand and then let it go. Heading upstream, I had a couple of shots at decent fish before running into another group of anglers. My morning was more successful than I had hoped for, and so I happily headed back to my car for a break. It was time to look for another spot. By this point in the day, a few things were coming back to my remembrance. Just the day before, a gentleman I spoke with had mentioned that the Lamar was muddy when they passed it. The week before, rain had fallen across the watershed. Known to muddy easily and clear slowly, the Lamar is said to fish extremely well if you hit the stream on the day that the water is clearing, or at least that is what my memory was telling my based on repeated readings of Craig Matthews and Clayton Molinero's Yellowstone Fly-Fishing Guide. As it turns it, both the book and my memory were correct. I was in the middle of the day of days, one to remember for many years to come. The afternoon was warming even more than I had anticipated with the temperature gauge on my car pushing into the upper 70s. Driving towards the next spot with my windows rolled down, I heard the sound I hadn't dared to hope for this late in the season: grasshoppers!!!! Having driven past the junction pool where the Lamar River and Soda Butte Creek join many times over the years, for some reason I never actually stopped to fish there. As it turns out, that was a mistake. The hardest part about fishing here is finding it open. Normally there are other anglers already fishing it, but on this day of days I found it open and beckoning me. This time I found rising trout. Best of all, they liked my hoppers. I'm not fancy when it comes to fishing and tying hoppers. My hoppers are simple foam and rubber leg jobs, quite similar to the classic Chernobyl Hopper. Apparently the fish liked them though as they chewed threw one and then another until I was glad that I had fly tying materials and a vise along with me. I would be tying again that evening. Eventually, I did something I never thought I would do and quit fishing. At some point, it is probably greedy to keep catching trout under such conditions. I was more than satisfied and decided to hike up to Trout Lake just to see the scenery and see if any fish were moving around. After a quick but intense hike up the hill, I headed straight for a spot that normally holds a fish. Sure enough, there it was. The hopper was only mildly interesting but a beetle was much more intriguing. Enough so, in fact, that I hooked it after only 2-3 casts. A quick circuit of the lake and a hike up to the next lake above provided some great views but no more trout. By this time, the sun was headed towards its rendezvous with the horizon. Recognizing that I had enough time to head back to camp and still fish an hour or so, I decided to make a run for it. The Gibbon was calling. Along the way, I found the usual bison and also some bighorn sheep posing for tourists taking pictures so I joined in the fun. Some days you just want to catch brook trout. For me, those days occur with frequency although not so often as others probably experience. 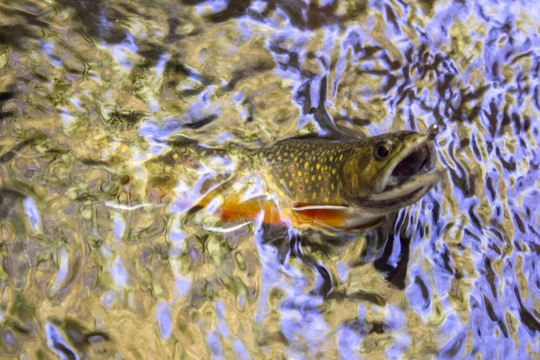 Normally I would have spent a couple of days dedicated to fishing for brook trout in late September when the fish are on the feed as they prepare for the rigors of the spawn, the weather is still pleasant, in other words the fishing is perfect. This year, I had to suffer through a trip to Yellowstone during late September and then had to make up for it by fishing for brook trout in October during the best of the fall colors. I know, life is tough. Originally, the day had tentatively been planned as a muskie fishing expedition but through a series of unfortunate circumstances, those plans fell through. Option two appealed to me for a short time before I quickly jumped to option three, fishing for brook trout. The stream involved a bit of a walk as do most quality brook trout waters. Thankfully the time passed quickly talking with a friend who was able to join me for the day. We were soon walking past water that looked increasingly fishy. Before long, the pressure was too great and we jumped in to start fishing. Things started off slowly and I don't mean that in the normal sense. We were catching fish, but only small ones. In fact, I think I caught my smallest fish of the year several times over. 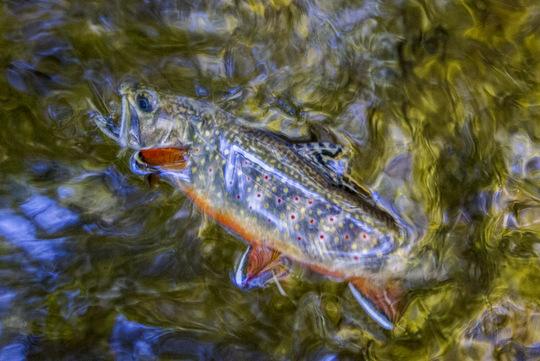 The young of the year brook trout were voracious, but eventually persistence paid off and some of their elder brethren succumbed to our offerings. At least two or three spots had spawning fish doing their thing and we left them alone. 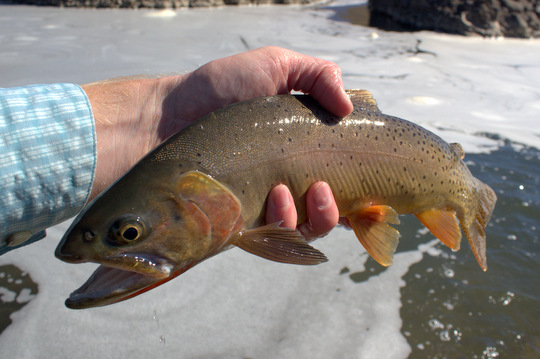 Fishing to spawners is not advisable on wild or native trout streams. Those are the future of the fishery and should be left alone to do their thing. Those that weren't actively spawning kept us more than occupied. The better fish were dressed up in full fall dress. 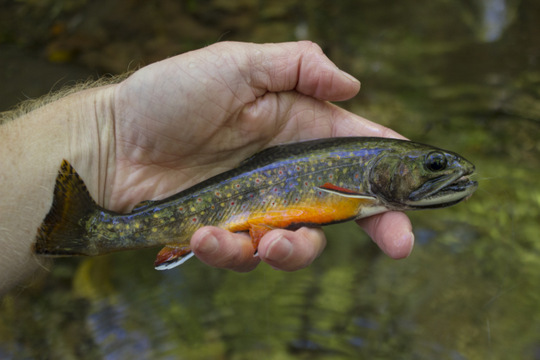 I'm not sure if there is a fish more beautiful than a colored up brook trout or spec as the locals call them. Over the course of the day, we both caught good numbers of fish. I was using my favorite small stream rod, an old Orvis Superfine Tight Loop. The rod is eight feet long and throws a four weight line, flexing clear to the handle when you get a feisty fish on the end of your line. At the beginning, I chose a Black Elk Hair Caddis and dropped a #16 caddis pupa behind. The dropper seemed to do its best work on the smaller fish while the best fish of the day mostly had a preference for the dry (but not all). I have no idea how many I caught, but I do know that two separate holes were both good for 5 fish apiece so you know the fishing was pretty good. By the end, both flies were chewed up to the point of retirement. The fish were not the only things dressed in their fall best. 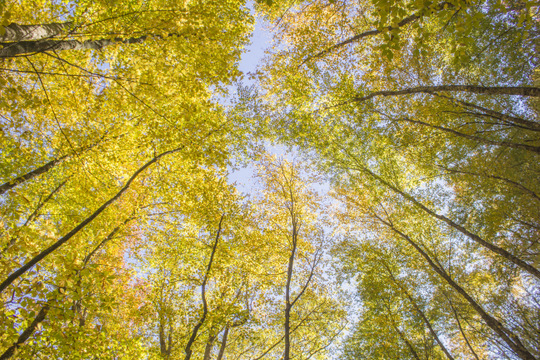 Many of the trees are reaching the fall color peak right now. Eventually the day drew to a close. We made the hike back down amid lengthening shadows and cooling temperatures. I was heading for Elkmont Campground for the night so I could get up and fish again the next day. As it turns out, the next day would be great as well, but that is a story for another time. 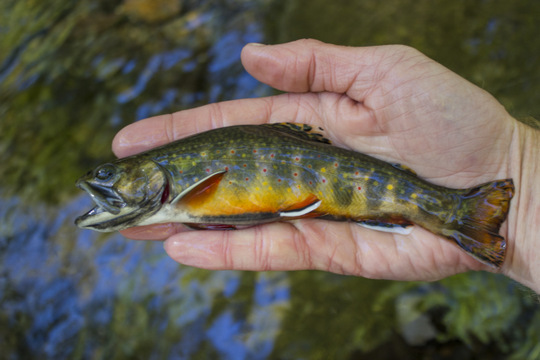 Want to fish for brook trout in the Smokies? 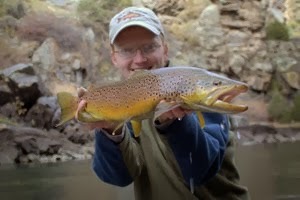 Contact me about a guided fly fishing trip at TroutZoneAnglers@gmail.com. 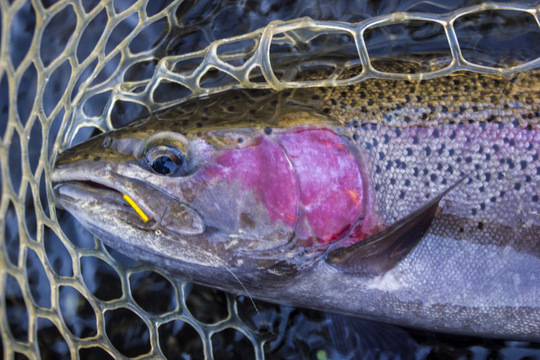 If you like to fly fish, you should be at Fly Tyer's Weekend 2015. Geared specifically towards fly tyers, it will involve plenty of fun and entertainment for non tyers as well. The event is sponsored by Tremont Lodge & Resort, Little River Outfitters and the Southeastern Council of the International Federation of Fly Fishers. A showing of the IF4 (International Fly Fishing Film Festival) will be happening Saturday evening. In addition, learn fishing tips and tricks from each tyer on how to fish their favorite patterns and more. I will be tying Sunday afternoon so stop by, say hello, and discover some of my favorite patterns for fly fishing in the Smokies. For more information, visit the page on Fly Tyer's Weekend. Arriving late to Yellowstone can be a risky thing. I always forget how incredibly far it is and how long the drive is across Wyoming. The original goal was to be in the Park by midday on Sunday, but between stopping to sleep a few hours in the car on Saturday night and buying some groceries on Sunday, I arrived in the Park late in the day. 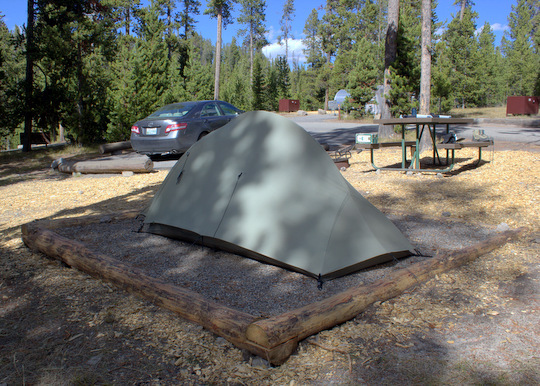 The sign at the South Entrance informed me that all of the campgrounds were already full except for at Lewis Lake. Luckily that was the closest so I had a chance to claim a site. Sure enough, I snagged a site but none too early as lots of forlorn looking travelers were doing the drive around the campground routine looking for a nonexistent available site shortly after my arrival. With an hour or two until sundown, I walked down to the lakeshore and enjoyed the sunset before heading back for an early bedtime. The drive had me tired out, and I needed plenty of energy for the next few days of fishing. That night I was reminded how cold it can get in the high country, especially late in the season. However, being tired has its advantages so I slept quite well. 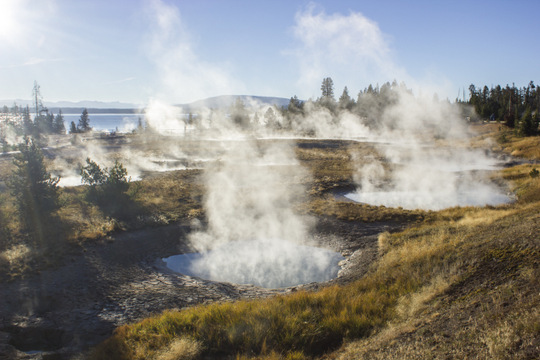 The next morning, I was up and packed before sunrise and made it to West Thumb Geyser Basin for an early morning photo opportunity. 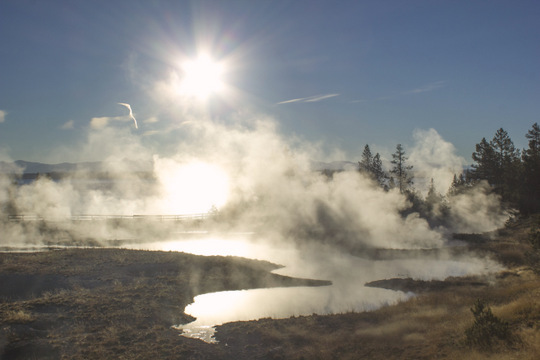 The early morning sun lit up the steam creating some beautiful views. A big bull elk surprised me on the way. 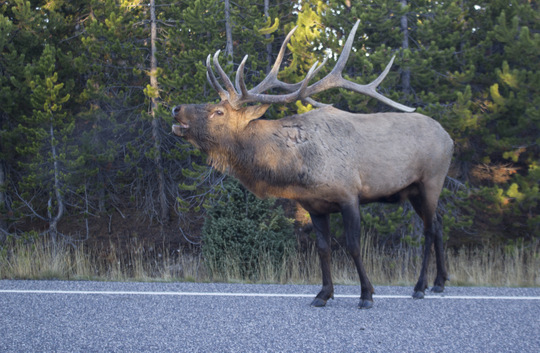 He was wandering in the road and bugling, his breath condensing into vapor in the cold morning air. Moving on down the road, I decided to take the scenic route over to Norris by way of Hayden Valley and Canyon. The idea seemed even better when I found a delicious breakfast at Canyon and a place to buy a fishing license. Full and content, I hurried on towards Norris and grabbed one of only a handful of available campsites. Clearly the crowds were still on the high side considering how late in the season it was. In no time I had my camp set up, and soon I had a rod strung up headed to the meadow stretch on the Gibbon right by the campground. 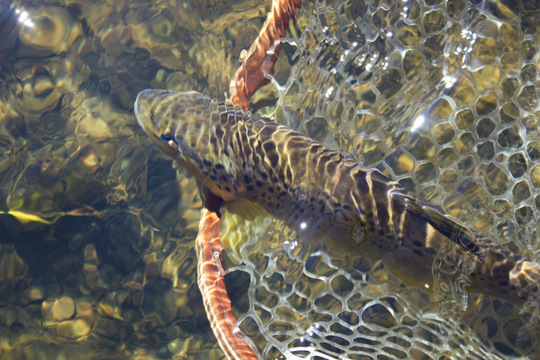 Shortly after starting, that first Yellowstone trout graced the end of my line, a gorgeous Gibbon River brown trout. 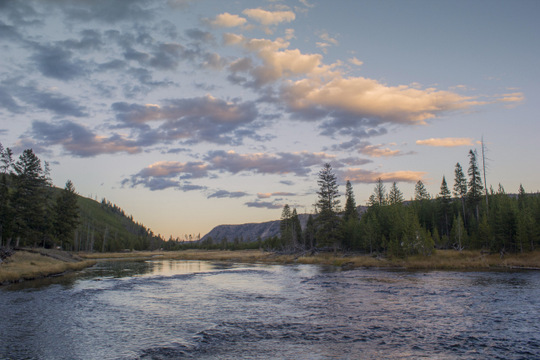 I continued up through the meadow, catching fish here and there, and as the sun was starting to drop in the western sky I decided to head for West Yellowstone. The sky over the Madison was worth a stop for pictures. 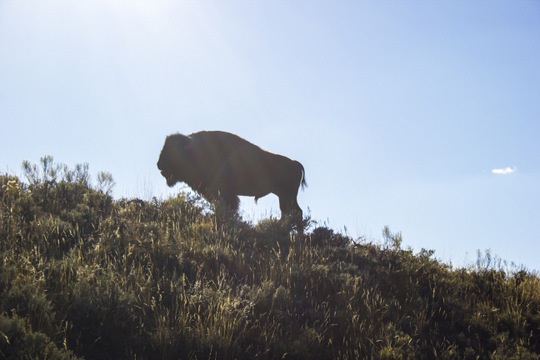 By the time I got back to camp, I was already completely satisfied with my Yellowstone trip and the adventure had only begun! The Caney Fork River has been going through its late summer and early full funk lately but is showing signs of breaking out as we get closer to November. Several floats over the last couple of weeks have produced lower than normal numbers of fish but some shots at quality trout. The numbers should improve as we head into November. Today we started early and landed the best fish of the day within sight of the ramp. It was a solid 16 inch rainbow. Later in the float, a larger rainbow broke off the 6x tippet that is required on these fish while a very nice brown came unbuttoned right at the boat. 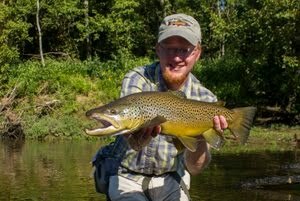 Some browns are starting to move around and this prespawn time is a great opportunity to sight fish to some large fish. Please leave the fish on redds alone though. Look just downstream from the redds for some great fish eating everything getting stirred up by the spawners. 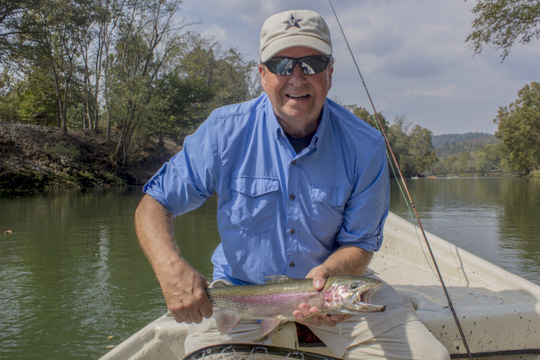 My first trip back from Yellowstone on the Caney produced the best fish of the fall so far, a solid 19" rainbow. The fish was caught by Gary Dowd who did everything perfectly to land this solid trout. Hooking them is only half of the battle at best, and these large fish will normally pull out all the tricks once hooked. Conditions will continue to improve as we go into November. If things stay relatively dry, expect the river to have very good float conditions by the first week or two in November hopefully. If you are interested in a guided fly fishing trip on the Caney Fork River or in the Great Smoky Mountains National Park, please contact me at TroutZoneAnglers@gmail.com or call/text (931) 261-1884. Thanks! With my Yellowstone vacation wrapped up, I'm still deciding whether or not I'm glad to be home or not. Like all good trips this one had to end, but not until I had caught plenty of big trout and enjoyed some unseasonably warm weather. Foul weather and large numbers of lake run fish would have been nice, but not waking up to lots of snow and freezing temperatures was also nice. 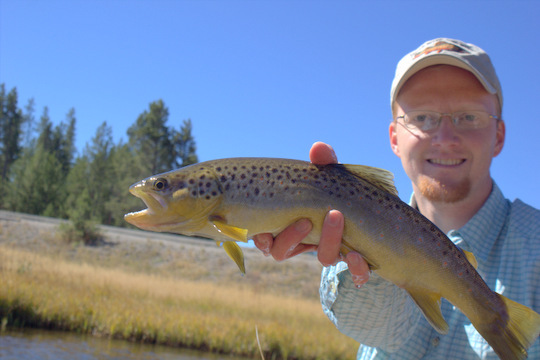 One of the best parts about the trip is that I threw streamers or hoppers almost exclusively except for when I dropped some soft hackles off of the streamer or large nymph for the lake run fish. Lots of streamers were thrown including one of my favorites, the PB&J. 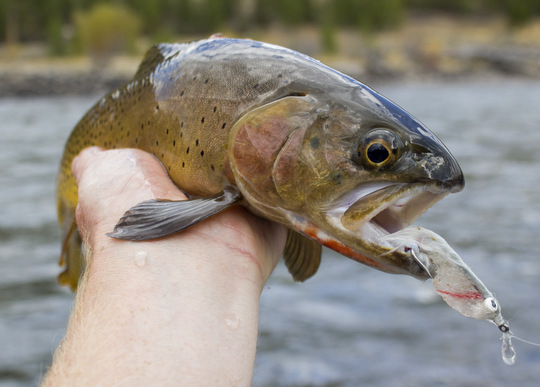 As it turns out, Yellowstone cutthroat love the PB&J just about as much as Tennessee tailwater trout do. This despite the fact that there are not any shad around on the Yellowstone River, but the lack of shad did not seem to make the fish shy about eating it. Apparently it is just one of those patterns that catch fish under a large variety of circumstances. I'm still in the middle of processing the many gigabytes of pictures that I took. Starting in another couple of days, I'll be guiding pretty steadily for a while also. 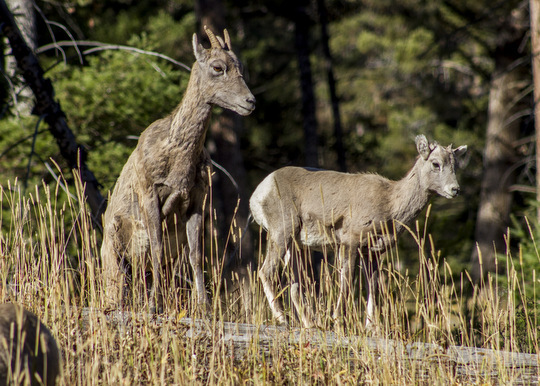 That means that Yellowstone reports will come along but may stretch out over the next month or even two. Thank you for your patience. In the meantime, watch the Little River Outfitters message board for an initial abbreviated report and also my Facebook pages for the Trout Zone and Trout Zone Anglers for pictures and other tidbits from the trip. Some pictures will also show up on Twitter. 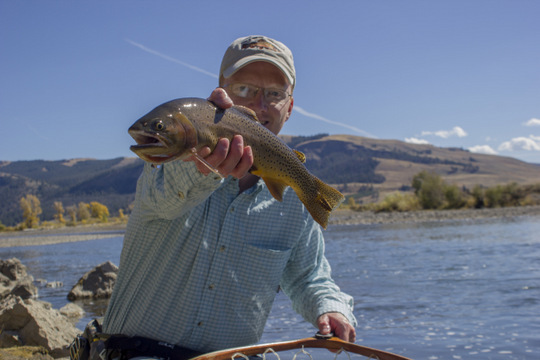 If you are looking for a guided fly fishing trip this month or next, the calendar is getting close to full. Book sooner as opposed to later or else I will be out of open dates. Right now, I have October 21 and 22 available as well as some days the last week of the month. November is looking a bit more open as of right now, but the inquiries are starting to come in so don't wait too long. Contact me at TroutZoneAnglers@gmail.com if you are interested in a guided fly fishing trip in the Smokies or on the Caney Fork River. 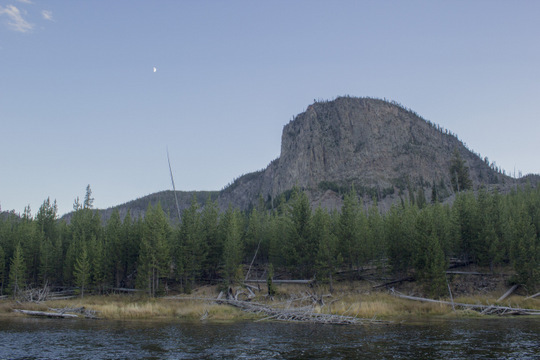 For the past two weeks, I have wandered at will across Yellowstone National Park, always with two or three fly rods strung up and ready to go. I caught large brown, rainbow, and cutthroat trout and mountain whitefish. Taking a vacation with no special plans other than to fish was a lot of fun. The opportunity to wake up each day and decide where to fish on a whim was refreshing, but I'm nearly as excited to get back to my streams in the Great Smoky Mountains National Park and the Caney Fork. 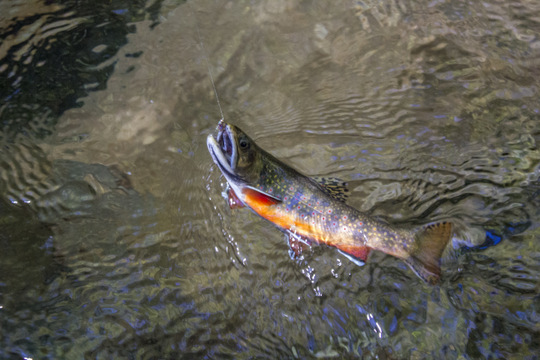 The fish above was caught on the Firehole River below the falls and was one of the fish that had made its way up from Hebgen Lake. Lots of great fish were caught so stay tuned for much more on this great fishing trip including plenty of pictures and even some pattern tips and recipes! 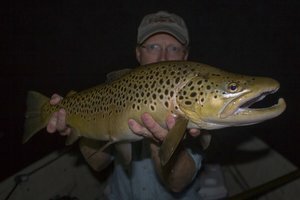 I expect some large trout to be caught on the Caney Fork over the next two months, primarily subsurface on nymphs and midges but also a few nice fish will come to streamers and even dry flies. 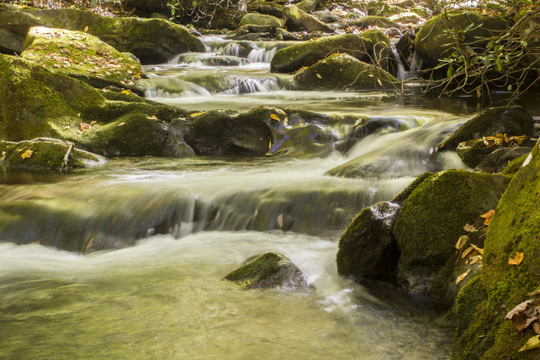 In the Great Smoky Mountains, rainfall over the last few days has helped to bump up stream levels. We can only hope for more rain as we go into the fall season but the fishing should be great regardless. Look for fall caddis, blue-winged olives, and still some slate drakes and golden stoneflies to keep the fish fed. Drop a small nymph or midge under your dry fly to double the fun. Terrestrials will also account for some fish up until the first hard freeze so keep those inch worm and ant imitations handy. Beetles have been gone for a while but if you come across a particularly difficult fish, try a beetle on it. The dry fly fishing should be good to great for at least the next month and perhaps well into November if we get a good year with no extremely cold fronts coming through until later in the month. 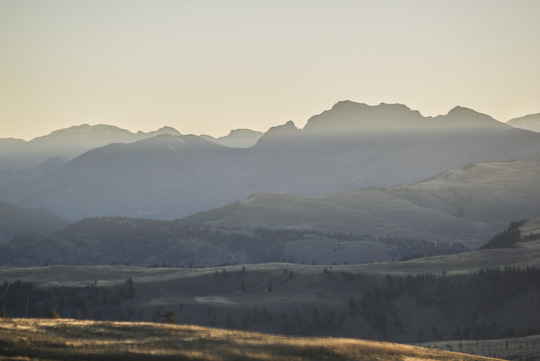 Stock up on #12-#14 Orange Stimulators and #18-#24 Blue-winged Olive Parachutes and head for the mountains to enjoy the fishing before winter hits and slows things down.